Chesterfield Career & Technical Center students of the Cisco Networking Academy, working alongside industry professionals, hosted the inaugural Hack4Troops cyber-security fundraiser event on Veterans Day and helped to raise over $14,000 to support veterans through the Tech For Troops Project. High school students, college students, and professionals came together for this unique cyber security event. Last February, three high school students from the Cisco Networking Academy at the Tech Center got the idea to put on this event. Ben Allen, Nick Copi, and Ben Davies dedicated over 80 hours of their personal time attending meetings and developing challenges for this competition. Two alumni of the Cisco program, Erwin Karincic (Global Network Security Engineer at UpTime Solutions) and Vincent Morris (Security Analyst at GE Security), assisted greatly with the scope of this competition, as did their instructors and business partners from the Cisco IT Advisory Board. Corporate donors and partners included Amazon, Estes Express, Maxx Potential, UpTime Solutions, Vikoa Networx, (ISC)2, Commonwealth IT, ECPI, and 13 Stitches. 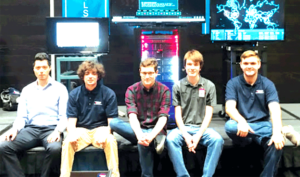 The Cisco Networking Academy, led by industry certified instructors Scott Steinruck and Peyton Chichester, is a premier IT training program in the Chesterfield County schools offering a chance for students to gain real-world experience in hardware, software, networking, and cyber-security technologies. Development is already underway for next year’s Hack4Troops event.